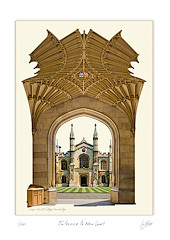 Corpus Christi College was founded in 1352 by the Guilds of Corpus Christi and the Blessed Virgin Mary and is the only college to have been founded by Cambridge townspeople. The first four sided college court was built here and Old Court is one of the oldest buildings in Cambridge. New Court was designed in neo-Gothic style by the architect William Wilkins, who is buried in the present Chapel, built in the 19th century. Some of the glass used in its windows is medieval and was imported from the continent. Adjacent to the Chapel is the Master’s Lodge. At right angles to the Lodge is the Parker Library which contains many priceless books and manuscripts saved by Matthew Parker, Archbishop of Canterbury under Elizabeth 1, from destruction during the Dissolution of the monasteries.